The SKS is a powerful and accurate rifle, especially popular with old-school rifle enthusiasts. All weapon systems are prone to customization in the right hands, and the SKS is no exception to this. 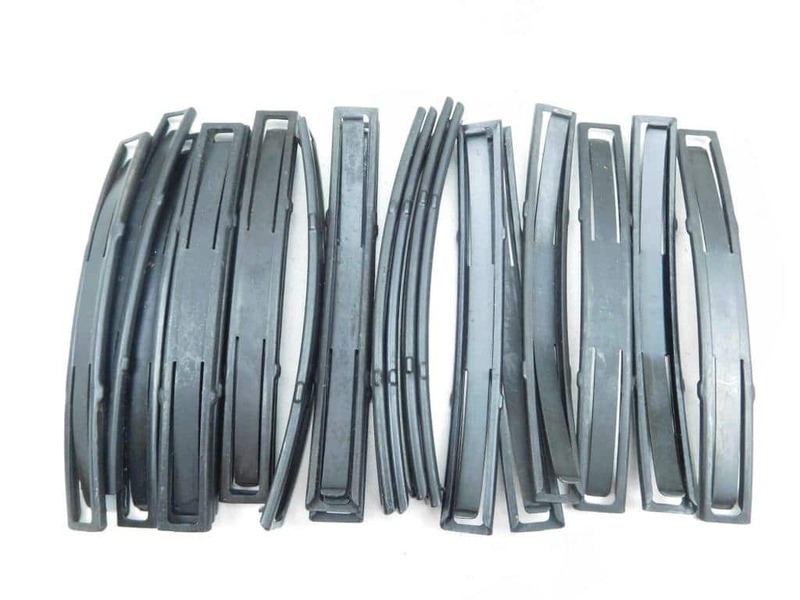 With emerging aftermarkets and the versatility in its use, a ton of different magazine options are available for the SKS. With all the aftermarket upgrades available right now, you should upgrade your SKS rifle to make it more effective and power packed. The focus in this article will be the SKS magazine and its upgrades. We will be talking about conventional stripper clips and mags and will compare them for the SKS. We will also review the best SKS magazine on the market to help you with your buying decision. So let’s begin. Why are Aftermarket SKS Magazines Best? If you possess an original, non-customized SKS rifle, it'll feature a built-in internal box magazine with a capacity of 10 rounds. The SKS was invented at a time when the rifle industry was still relying upon semi-automatic and single shot guns. With the advancements in rifle technology, there are numerous types of accessories available, and one of them is the magazine. The SKS features an internal box magazine which has to be loaded either using a stripper clip or by hand round by round. Loading an SKS is a somewhat time-consuming process as compared to using a magazine. Apart from that, using a magazine protects you from unnecessary fatigue and probable injuries. Magazines for the SKS are available in 5, 10, 20, 30, 35, 50 and even 75 round capacity variants. This enhances your overall shooting experience and prevents you from loading rounds every now and then. Additionally, using magazines for your SKS enhances your ammunition carrying and managing capabilities. If you are using your SKS for competitions, the 10 round capacity and stripper clip loading mechanism are surely not going to help. A good SKS magazine must be durable, quick to load, easy-to-attach and efficient with cycling rounds. SKS Stripper Clips vs Detachable Magazines - Which is Ideal? Many think detachable magazines are better. Stripper clips have their advantages over magazines, but comparing the two is like comparing an axe with a chainsaw. A stripper clip is a curved piece of metal that has a margined groove to hold 5 or 10 rounds at once. To load the rifle, all you have to do is fit the end of the clip into the groove of the loading port and push down the rounds within the internal magazine with a push of your thumb. Well, this might be easy and quick for a seasoned WWII soldier who had loaded hundreds of rounds using stripper clips, but when compared with load time of magazines, it is quite slow. The average time for changing a magazine is 3-4 seconds, whereas the average time for loading rounds using a stripper clip can be anywhere between 7-8 seconds or more. Additionally, the loading slot is harder to find for the stripper clip, as compared to the wide magwell for the magazine. Apart from this, stripper clips are also prone to losing rounds while carrying or loading. They may fall out of your pocket or when you try to load them into the SKS. All these facts are in no way intended to insult the stripper clips. Stripper clips are lightweight, very economical, and cheap option when compared to magazines. You can carry a lot of these clips at once without adding much weight to your gear. However, the agility, holding capacity, and ease of use with magazines overshadows the qualities of stripper clips. Feeding ammunition to your SKS under a stressful situation is far easier when using a magazine, as compared to the stripper clips. Additionally, you can also injure your fingers or get them fatigued while trying to use clips. Stripper clips are surely not for people with finger arthritis as well. Based on the features, ease of use, efficiency, and price, we've sorted out the best SKS magazines currently on the market. The Archangel LVX is a 35 rounds magazine designed especially for the SKS. 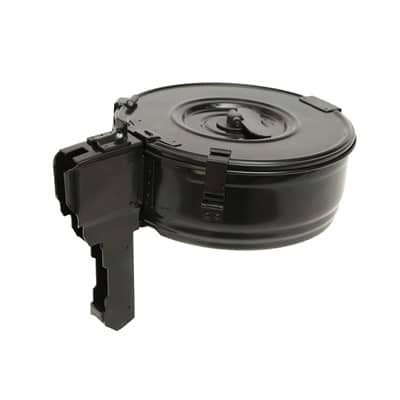 The magazine features a hardened polymer body and uses an efficient spring made from heat treated silicon wire. The follower of the mag has also been made from polymer and helps in feeding rounds to the SKS efficiently. The extra duckbill on the front of the magazine makes it fit different models of the SKS easily. 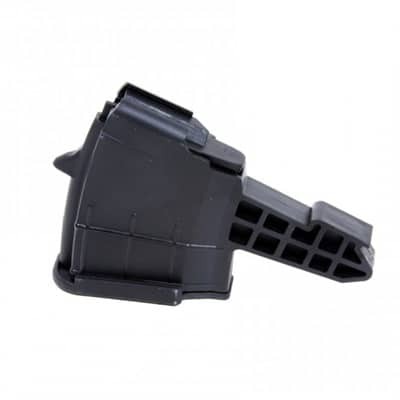 It eliminates the need to install an internal adapter for using normal magazines without the duckbill. The textured design of the magazine provides a firm grip while changing. The magazine is also available in a 20 round capacity variant. Large Carrying Capacity (35 rounds). Polymer doesn’t resist heat and hard usage. It might be illegal in some states. The Archangel is a perfect magazine for 3 gun competitions and shooters who like to fire many rounds at once. 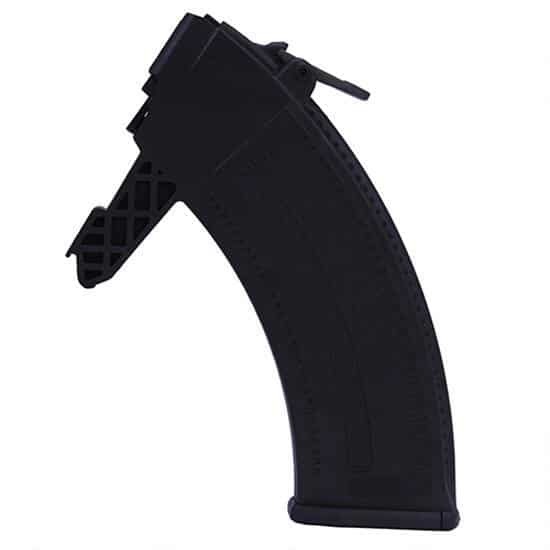 The polymer design of the magazine is lightweight, and the feeding mechanism is quite efficient. It has also been priced at a decent price point so it won’t hurt your budget. The only concern is if it complies with your state laws. The Tapco Weapons polymer magazine for the SKS is an effective upgrade to a rifle. The 20 round capacity of the magazine is optimum for most shooters. To use this magazine, you simply have to remove the rifle's internal magazine and hinged floor plate, then you’re good to go. 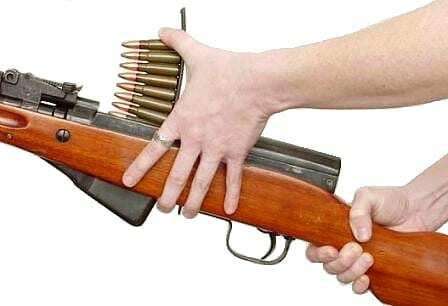 Several rifles with wooden stocks might require alterations to the Magwell. The anti-tilt follower ensures proper feeding of rounds, whereas the steel base plate is an addition to the durability of the rifle. The horizontal ribbing on the exterior provides a firm gripping surface to the shooter. Also, the company offers a lifetime warranty over this product. Counts as three parts for compliance with U.S. Code Title 18 Section 922(r) part-source requirements. The magazine is also available in a 10 round variant. Locks firmly and doesn’t wobble. Polymer prone to wear and tear. The Tapco 20 round magazine for the SKS is a lightweight and easy-to-install magazine upgrade to your rifle. The magazine is quite renowned in the market and is available at an exceptional price point when compared to its counterparts. The 20 round capacity is quite balanced providing you with ample ammunition to shoot, meanwhile not adding much to the weight of your SKS. The Pro Mag SKS magazine features polymer construction and a five round capacity. This magazine is designed for people who live in states where 5+ round capacity mags have been banned. This SKS magazine can be easily installed in your SKS without making modifications to the original stock. The magazine has been designed using DuPont® Zytel™ based polymer which ensures a long service life. It is not prone to malfunction and works efficiently. The duckbill design eliminates the need for an adapter. Usable in States with restrictive laws. This ProMag SKS magazine has a limited 5 round capacity which is even less than the original ammo holding capacity of the SKS. However, this magazine is useful for shooters who live in states with laws restricting mag capacities to less than 10 rounds. The price point is quite decent and won’t hurt your pocket. The KCI magazine is a custom-made option for SKS enthusiasts who like to shoot an SKS like a machine gun. The magazine can be opened using two latches provided at the rear, without fighting the spring tension. It can be stored for a long duration with zero tension on the spring. 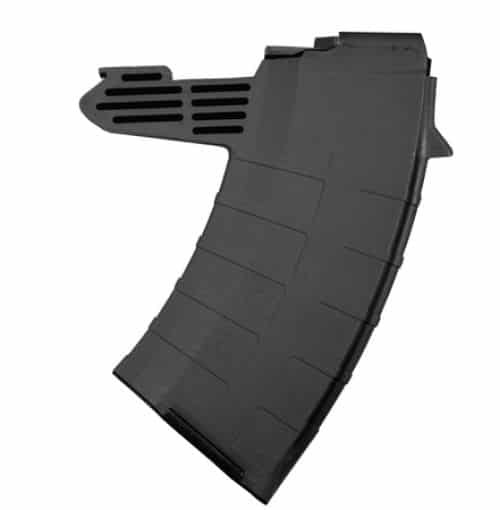 The magazine has been designed using stamped steel and has the capacity of 75 rounds. This drum magazine is manufactured in South Korea too. Can be loaded Directly without fighting the spring tension. Can be stored with zero spring tension. Stainless steel body and round capacity make it heavy. Only useful for range shooting. The KCI magazine offers you a huge 75 round capacity so you can shoot for longer durations without the need to reload. It can be loaded quickly by opening the rear cover, reducing load times. However, the magazine is only useful for shooting down the range. Using it for hunting, defense or competitions does not seem practical. It has been priced to fit almost everyone’s budget. Overall, the SKS has a limited holding capacity of 10 rounds, which is also time-consuming to load. Stripper clips are quite slow to use and handle as compared to magazines. Using mags offers greater ammunition capacity and quick reloading of the SKS. A good SKS magazine must be lightweight, durable and should fit snug with the SKS. 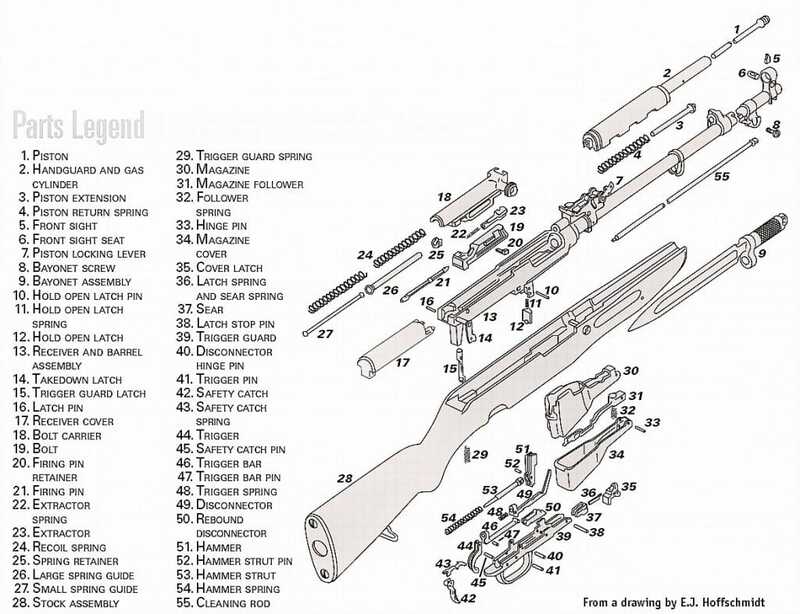 Additionally, make sure to check with your local state laws before upgrading your SKS magazine.